The cozy holiday home has 2 floors and was completely renovated and furnished in 2016. Here, the furniture and furnishings were tastefully arranged and matched in color, so that a harmonious overall picture was created. Classified by the DTV with 3 stars it offers you a good comfort, so that you can make your vacation as pleasant as possible. The two bedrooms are located on the first floor. The cozy and new box spring double beds, each have different degrees of hardness on one side (hardness grade 2 and 3). If traveling with a toddler, a high-quality 1,40 x 0,70 m cot can be placed in the larger bedroom. A highchair and stair gate is also included in the equipment. 1 to 2 additional sleeping possibilities are again in the living room on the spacious sofa bed. The living and sleeping areas are equipped with a beautiful and newly sanded wooden floorboards. The new kitchen offers a ceramic hob, oven, coffee maker, a Caffissimo capsule machine, refrigerator, toaster, microwave, kettle and crockery and many glasses a good comfort. The bathroom was also newly renovated in 2016, tiled and lovingly equipped with a rustic vanity, toilet and a floor-level walk in shower. Bed linen, towels, tea towels and consumption energy are included. You can also use free Wi-Fi during your stay. A flat-screen TV, a DVD player and a mini stereo system as well as numerous books and novels complete the offer. An additional cozy place to stay is in the front conservatory with direct access to the garden. The garden is about 100 m² and invites you to barbecue, enjoy the sun or just to relax. The garden has seating with table for 4 people and two sun loungers, a parasol, and a barbecue. 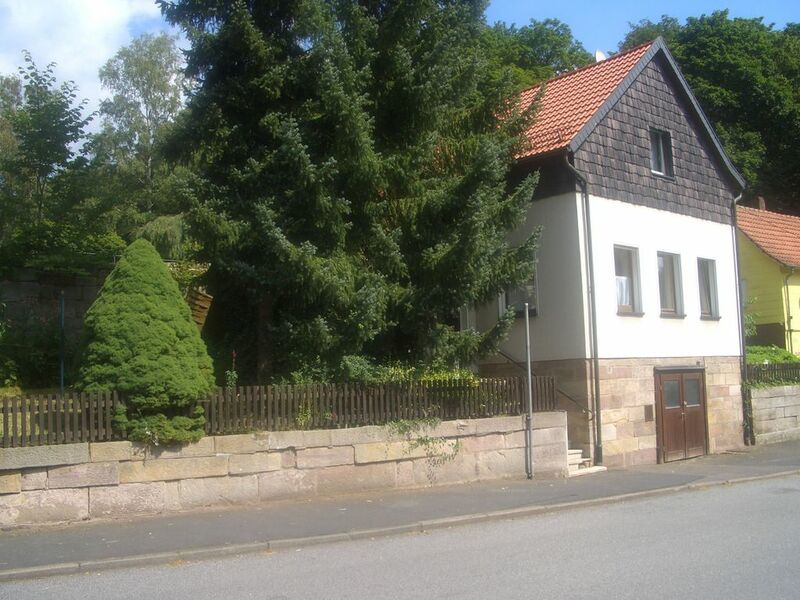 The house is centrally located in Gersfeld in a 30 he zone. During your booking you have the holiday home all to yourself. Numerous restaurants such as a pizzeria, Greek restaurant, German cuisine, several cafes and an ice cream parlor, as well as shops for daily needs can be reached on foot from the house. The marketplace and the castle park, with children's playground and Kneipp facility are about 2 minutes away on foot. Many hiking and cycling trails start right in Gersfeld, so you can leave your car during your stay. It is also possible to store your bikes in the basement. A parking space for your car exists in front of the house. Die Gastgeber versuchten noch, ihr Häuschen in der gebuchten Zeit anderweitig zu vermieten. Doch leider vergebens. Umso mehr überraschten und beeindruckten sie uns, als sie später anboten, einen Teil der Gebühr zurückzuerstatten. Welch Freude und Erleichterung inmitten der anderen (schwierigen) Ereignisse! :-) Welch Mitgefühl und Großherzigkeit von Seiten der Vermieter! Wir sind zutiefst dankbar und freuen uns, dass es noch solche Menschen gibt! In der Rhön ist's schön. Wir haben den Aufenthalt, trotz dem durchwachsenen Wetters in dieser gemuetlichen Ferienwohnung genossen. Nette van bijna alle gemakken voorziene ruime woning (Oven, magnetron. Geen vaatwasser, maar in de vakantie ouderwets afwassen is best leuk). Dichtbij centrum en supermarkten. Ook fijn dat er ruim voldoende handdoeken en keukenlinnen aanwezig waren! Uitstapjes gemaakt naar Fulda, Zella-Mahlis (Aquarium), Meiningen, bij Gersfeld de Wasserkuppe en het wildpark, stoomtrein-rit Fladungen-Mellrichstadt, slot bij Eichenzell en gewandeld in de omgeving. Het enige minpuntje vonden wij het ontbreken van een terras buiten, in de winter is dit vast minder belangrijk maar in de zomer verwacht je iets meer dan een smal pad door een grasveldje. Wir haben zu viert (zwei Paare) ein schönes Silvesterwochenende in dem Ferienhaus verbracht. Das Haus ist super ausgestattet, liebevoll renoviert und überaus gemütlich. Der einzige Wermutstropfen war die Heizungstherme, die in einem der Schlafzimmer hing - sie war doch ziemlich laut und störend. Sehr positiv: das Haus liegt sehr zentral, so dass Schosspark, Café, Restaurants und Geschäfte schnell erreichbar waren. Parkplatz direkt vor dem Haus war auch ausgezeichnet.